Harar stands near the edge of the eastern highlands overlooking the Great Rift Valley, about 500 kilometres east of Addis Ababa. In 1912 the vice-consul was renting a house a little outside Harar, then Ethiopia’s ‘dirtiest and most crowded city’, that belonged to Ras Makonnen, father of Haile Selassie. The house was over twenty years old and in declining condition. The vice-consul pushed for something better to be built and in 1914 a site was bought for £80 for this purpose. The Abyssinian authorities, however, stopped completion of the deal because the site was too close to one of their defensive positions: the money was returned two years later. 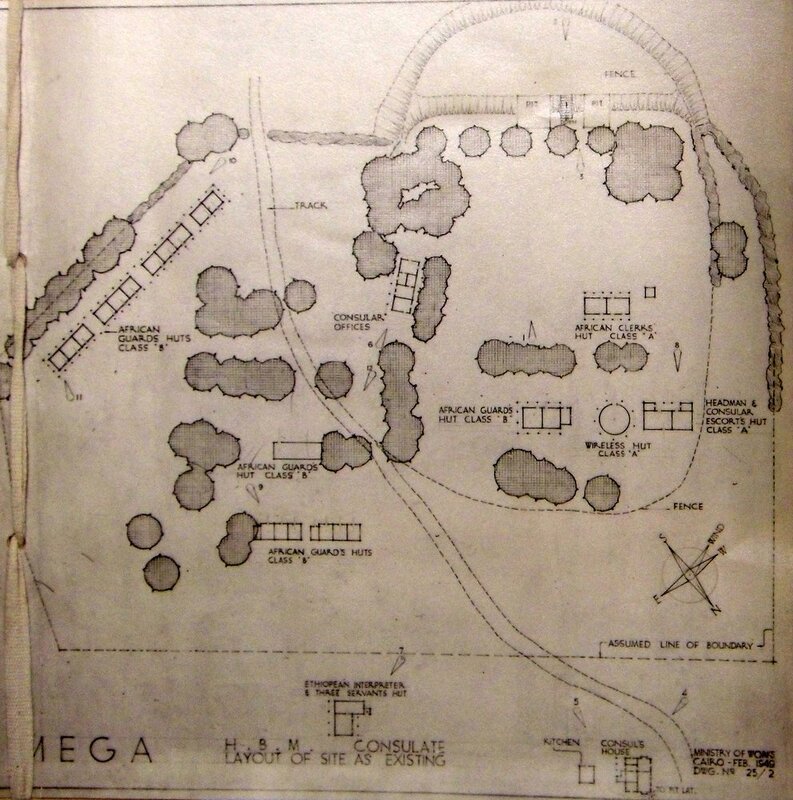 In 1920, a site of a little over eight acres in two adjacent plots was bought for £250, subsequently called the Jinela site. Again, no realistic prospect of a new building transpired, so the lease on the old Ras Makonnen house, with its three acres of grounds, was instead renewed for another 20 years. The Jinela site was transferred in 1923 back to the government of Somaliland for £160, a transfer that was completed in 1925, only to be returned to the Office of Works in 1935 and the £160 refunded. Two battalions of Italians camped on it during their occupation of Ethiopia between 1935 and 1941. In 1943, when the accommodation for a re-opened consulate was under discussion, the minister at Addis Ababa sought the advice of Haile Selassie, who also held the title Duke of Harar. His response was to give the British a three acre site close to the old Ras Makonnen house “as a token of good friendship and the happy reminiscence of my stay in London [he had spent his exile in England] which I carried home with me.” Two buildings recently erected by the Italians stood on the site: the larger, known as the Residenza, had been built for the Italian governor and the other was a bungalow nearby. These were brought into use as the consulate and served until the post was closed in 1960. The premises were thereupon returned to the royal family. After 1941, the Jinela site slipped into the possession of one of the royal princesses and it was not until 1953 that the Office of Works’ title was finally re-established: the site, with a suburb developing around it, was registered as being in Section Jinela in the district called Buda Bar. Various schemes had been drawn up for it over the years but it was still an undeveloped site when passed back to the authorities around 1960. 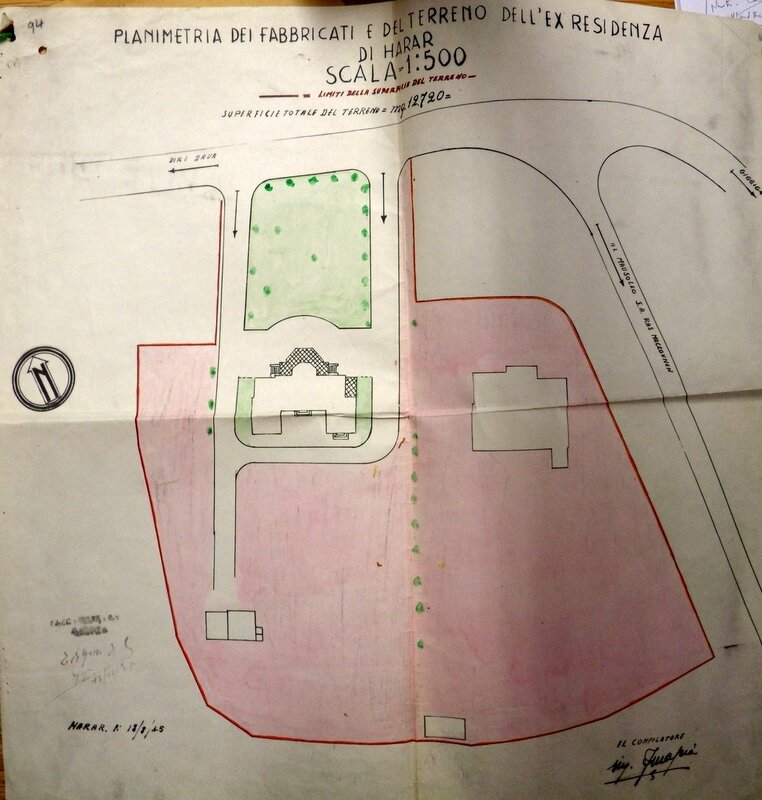 1937 Italian plan of the Residenza site in Harar, given to the British in 1943. Ministry of Works (Cairo office) drawing of exisitng Mega compound, 1949. 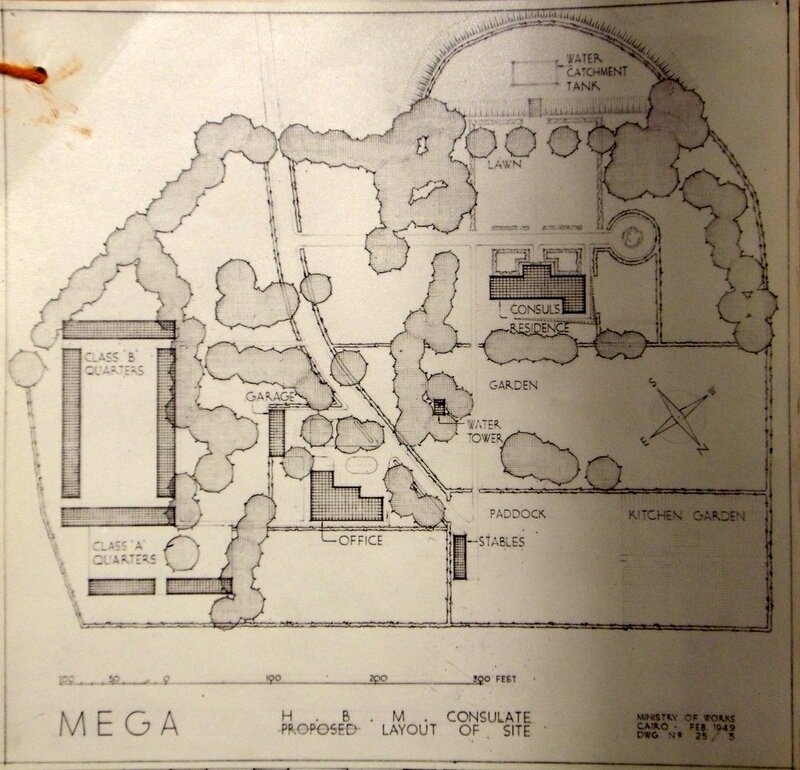 Proposed Mega compound layout, 1949, completed 1952. Front of new consul’s residence at Mega, 1953. 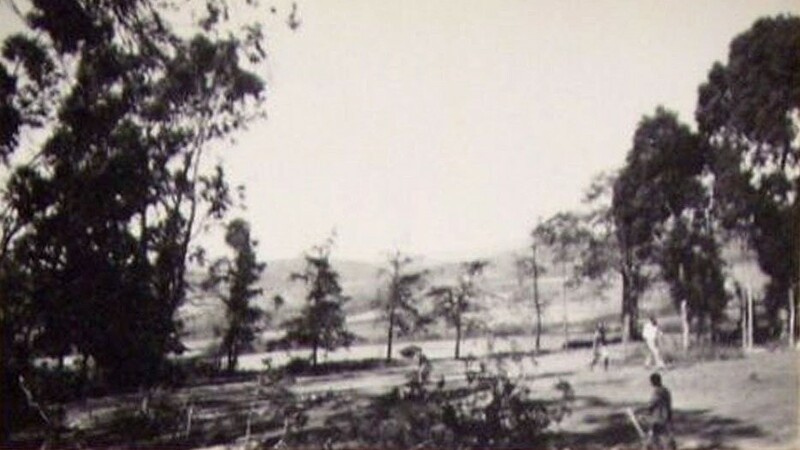 View from residence of compound and beyond, 1953. 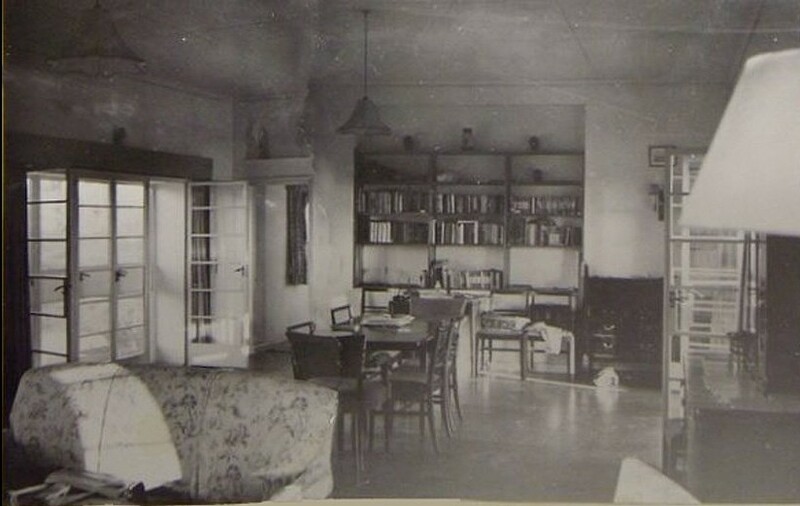 Living room in new residence, 1953.